Julian Bateson, New Zealand Tree Grower February 2019. 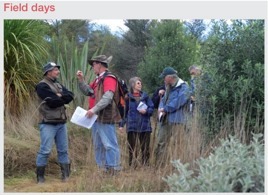 In October last year the regular conference on the research projects funded by the Forest Growers Levy was held in Tauranga. The registration list showed over 120 attendees had registered to be there. Most of them were from the larger forestry companies, the Ministry for Primary Industries, Scion and the Forest Growers Levy Trust itself. The number of small-scale foresters and members of the NZFFA was quite low, but this is understandable if disappointing. First, the cost of being there for most of us for three days if you add up the conference fee, air fares and accommodation was well in excess of $1,000. Then there are the three or four days of time required for travel and attendance which has to be allowed for out of the working week – those from the larger organisations were generally being paid to be there. Another reason for small-scale foresters not wanting to go to the conference could be that much of the research is seen as being predominantly of more direct and immediate value to the owners of larger forests and the corporate forest owners. However, over the years, more of the levy-funded research has direct or indirect benefits for owners of small forests. 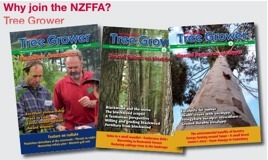 Regular readers of the Tree Grower will have noticed the recent series of short articles about levy-funded research targeted at owners of small forests. In this issue, for example, is one article on the quick coupler and another on managing the effects of red needle cast. The first hour or so of the conference was a summary of how the levy is working. I thought this would be a bit of a yawn but I was pleasantly surprised how the information was all put together. Even though I knew quite a bit about how the levy works, I learned some extra facts and I am sure this session was well received. The rest of the two days covered a variety of presentations on current research on various forestry concerns. I will not go into all the details as the presentations were filmed − I suppose visually recorded in a digital form is a more precise term − and all these recordings can be seen on the Forest Growers Research website. Many of these have had articles about them in recent Tree Growers, including this one. Part of the second conference day involved presentations on what many of us got to see on the field day at the end of the conference. The morning of this field day involved a visit to the port of Tauranga. The first stop was to see progress on automatic log scaling and measurement. For the development of the automatic system we were told that a total of 30,000 logs had been scaled using the proposed new method with just under 1,000 of them randomly selected and checked for accuracy by a manual log scaler. The maximum error allowed in such work apparently is three per cent but the testing showed that the proposed automatic system was always well within one per cent. For those of you who do not know much about log scaling, it is a complex process. It is used to work out the timber value of the log, noting important points such as how straight the log is and the uniformity of the shape. It takes a trained expert to do the work manually. The automatic process can be carried out in significantly less time, very useful when dealing with millions of logs each year. At the moment the experimental device used is a standard supermarket-type scanner working in conjunction with the camera on a mobile phone. It may not seem that important a project, but delays at ports are becoming more of a problem as the export trade increases, adding significant costs to everyone involved. Anything which helps reduce the delays, such as being able to scale the logs when they are loaded on the train or truck before being despatched to the port, saves time and money which eventually works its way back to improved profits for the forest owner. The other, but less successful, project we were able to see involved research to try and recapture the methyl bromide being used to treat logs before they are loaded on board ships. Some importing countries require this treatment for all logs. The methyl bromide story is complex one, but the simple facts are that methyl bromide is an ozone depleting gas and New Zealand should not be releasing it to the atmosphere. In 1989 the Montreal Protocol wanted all use of the gas to be strictly limited and the New Zealand government eventually set late 2020 as the date for no more of the gas to be allowed to escape when being used. The research over the past eight years has been to try and find a way in which logs can be treated and ensure all the unused gas is collected. None must escape. In spite of all the research and demonstrations we were shown by Mark Self, it appears that almost all the gas can be recovered, but not the 100 per cent required. There was little optimism that the project would do any better by the required date in 2020. The afternoon involved a visit to Summerhill Forest Park hosted by Gabrielle and Andy Walton with the main presentations from Scion researchers. The first of these involved a small kauri plantation and information about growing and evaluating plantation-grown kauri. In summary, planted sites should be able to produce merchantable kauri trees with a durable heartwood core within 60 years, kauri die-back permitting. The second discussion was about cypress canker and its increasing prevalence. The conclusion was that there were no new canker pathogens in spite of the increased prevalence and that manual control of canker is limited, as many of us know. The solution is continuing research into breeding and growing resistant seeds or clones so that hopefully, one day, we can grow cypress with canker-free confidence. The final presentation was how to manage pests which defoliate eucalypts. The research has shown that for small plantations under around 10 hectares, aerial pesticide application is uneconomic. The solution is biological control using parasitoids. It is a long-term process and the research by Scion will continue. These presentations completed the conference. Overall it was well worth attending to find out more details of how the bulk of the forest levy income is spent. It would be good to have more small-scale forest owner attendees, but the time and money which needs to be found is probably always going to be a limiting factor.